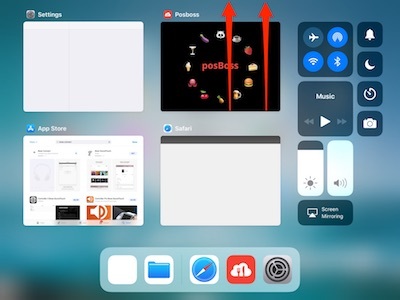 Here’s how to close out of the posBoss app and restart. This refreshes the app and can help resolve small issues. Click the iPad’s Home button on the iPad to display the main screen. Press the Home button twice again quickly to bring up the list of open apps. Scroll across (if needed) and locate the minimised posBoss screen. Swipe upwards on the minimised posBoss screen to properly close out of the app (as below).